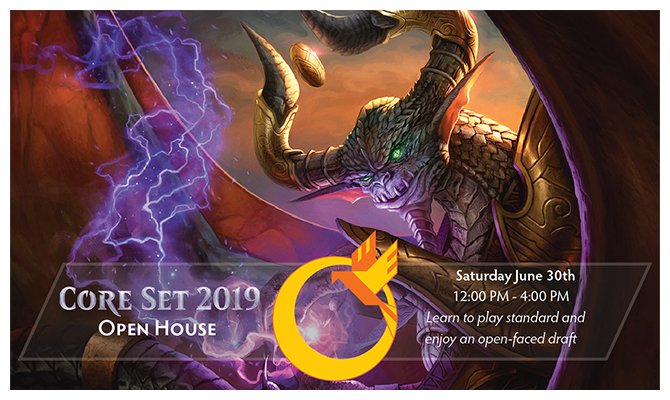 Learn to Play Magic at the Core 2019 Open House! Have you been looking to learn to play Magic: the Gathering or maybe just need to brush up on the rules? Stop by Saturday, June 30th for our Magic Core 2019 Open House. Store staff and friendly local players will be on hand to show you how to play, to give a refresher if you haven't played in a while, and to show off popular ways to play the game here at Phoenix! From 12 - 4 PM we'll be throwing open our doors to any who wish to learn the basics of Magic. We'll have free welcome decks available and we'll have staff and friends of the store on hand to teach the game. If you're an experienced player and still want to participate, why not come by with a friend who want to learn? All participants will receive a special promo card from the upcoming set Core 2019 (while supplies last). During this particular open house, we'll also be showcasing 2 different ways to play the game that are new player friendly. One of our most popular ways to play - Standard is a rotating format consisting of the most recent 2 years worth of sets. It's also usually the first type of deck most new players put together. We'll have players on hand to show you what this format looks like, and how to put together your first standard deck. As a special bonus - for those new players who want to get an extra-extra early sneak peak at the newest Magic set, we'll have a small number of Magic Core 2019 Planeswalker decks available for purchase above and beyond the free learn-to-play decks that we will be providing all new players. Learn the basics of drafting, or level up your draft skills! Unlike the rest of the events, there will be a $10 entry fee associated with this event to cover the cost of the booster packs. During the draft you'll have an opportunity to discuss your choices openly with the rest of the table and with experienced players. Think about what colors you want to play and make a plan before you make your first pick!